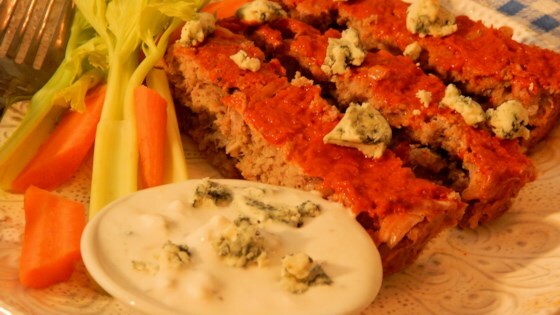 "Combining two favorite dishes to make one great meal, this baked meatloaf topped with homemade or your favorite bottled Buffalo wing sauce and served with an easy blue cheese dressing is sure to be a hit. Serve with home-fried potatoes or french fries and a salad!" Preheat oven to 350 degrees F (175 degrees C). Line a 9x13-inch baking pan with aluminum foil; spray lightly with cooking spray. Combine ground turkey, grated onion, salt, and black pepper in a large bowl; mix to combine. Transfer turkey mixture to baking pan and shape into a loaf. Bake meatloaf in the preheated oven until light golden, about 40 minutes. Melt butter in a small saucepan over low heat. Stir in hot pepper sauce, 1 teaspoon garlic powder, and 1 teaspoon onion powder. Pour evenly over meatloaf. Return meatloaf to the oven and cook until flavors are absorbed, about 5 minutes more. An instant-read thermometer inserted into the center should read at least 165 degrees F (74 degrees C). Combine sour cream, mayonnaise, and blue cheese crumbs in a bowl to make blue cheese dressing. Season with 1/2 teaspoon garlic powder, 1/2 teaspoon onion powder, and black pepper. Serve alongside meatloaf.